Astronomers peering closely at images of Pluto have spotted what look like dunes on the surface of the former planet. They wouldn’t be sand dunes, but dunes of methane ice—an Earthly feature on a totally alien world. Dunes don’t just happen—they require both tiny grains and some sort of force, like wind, to push them into shape. When New Horizons passed by Pluto back in 2015, it captured dune-looking features just beside a mountain range. It’s a testament not only to jut how interesting distant cosmic objects can be, but how far humans have come in our ability to observe rocks in space. 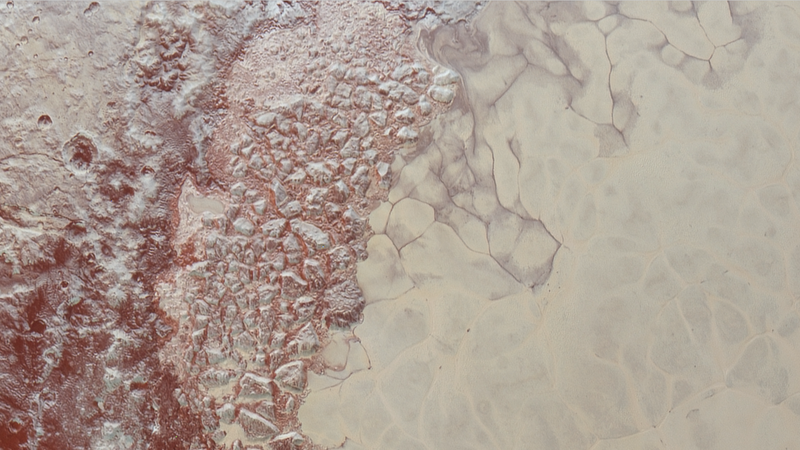 Pluto’s dunes appear truly Earthly. They’re situated parallel to the edges of the adjacent mountains and perpendicular to the direction of nearby wind streaks. But they’re nothing like the wind-swept, sandy dunes of the Sahara. Pluto’s atmosphere is far too thin to pick up and push tiny grains of methane on its own. Instead, the particles could be tossed into the air when nitrogen ice sublimes—turns from a solid into a gas, creating an upward jet of nitrogen gas. Once that happens, the planet’s feather-light breeze could push the methane particles, each about the size of a human fat cell, into the ridges observed by Telfer and the New Horizons team. Discovering the dunes was possible through the combination of an analysis of the famous map of Pluto’s surface produced by New Horizons during its flyby, and the use of another scientist’s modeling. The researchers published their results today in Science. It’s hard to imagine such a feature made any other way, though, said Telfer. And it wouldn’t be the first extra-terrestrial dune ever spotted, Hayes pointed out. Mars, Saturn’s moon Titan, and even the comet 67P/Churyumov-Gerasimenkoeach have seemingly Earthly wind-swept features. As to what this might mean for the “is Pluto a planet” debate, the answer is nothing. Pluto is still classified as a dwarf planet, and whether or not we call it a planet is irrelevant to Telfer and his team’s work. After all, There are a host of other interesting and large worlds beyond Pluto. “One thing we’re all looking forward to seeing is New Horizon’s flyby of a Kuiper Belt Object on January 1, next year,” he said. Who knows what mysteries await us on that rock, called Ultima Thule or 2014 MU69. Editor’s note: If you have an amazing skywatching photo you’d like to share for a possible story or image gallery, please contact managing editor Tariq Malik atspacephotos@space.com. The annual Eta Aquariid Meteor Shower, produced by material from Halley’s Comet, runs from Apr 19 to May 26 and peaks before dawn on Sat., May 6. True Aquariids will travel away from a radiant point in Aquarius, near the eastern horizon. Watch for up to a few dozen meteors per hour, including some fireballs, near the peak. The waning last quarter moon will degrade the sky for this shower. In the pre-dawn sky of Sunday, May 6, the last quarter moon will sit 2 degrees above Mars. Both objects will fit into the field of view of binoculars (orange circle). The binocular field will also include the globular cluster Messier 75, which will be positioned 3 degrees to the left of Mars. At its last quarter phase, the moon rises around midnight and remains visible in the southern sky all morning. At this phase, the moon is illuminated on its western side, towards the pre-dawn sun. Last quarter moons are positioned ahead of the Earth in our trip around the sun. About 3½ hours later, Earth will occupy that same location in space. After this phase, the waning moon traverses the last quarter of its orbit around the earth, on the way to new moon. On Tuesday, May 8, the major asteroid (4) Vesta will cease its regular eastward orbital motion (red path) and begin a retrograde loop that lasts until late summer. At this time, look for the magnitude 5.5 object sitting 6 degrees to the upper right of Saturn. On Tuesday, May 8 at 9 p.m. EDT, Jupiter will be exactly opposite the sun in the sky, and visible all night long. The planet’s disk will be the brightest and largest for the year. Around opposition, Jupiter and its four large satellites frequently eclipse and occult one another, and the moons cast round black shadows on the planet, as shown here. Just before sunrise on Saturday, May 12, Mercury and much dimmer Uranus will sit only 3 degrees apart, and very low in the eastern sky. Both objects will fit into the field of view of binoculars (orange circle), with Uranus to the upper left of Mercury. In the pre-dawn sky on the morning of Monday, May 14, Mars’ eastward orbital motion (brown line) will carry it to a position only 18 arc-minutes (or 2/3 of the full moon’s diameter) below the small globular star cluster designated Messier 75. Both objects will appear together in the field of view of a high power telescope (yellow circle). In the pre-dawn southern sky during the mornings surrounding Monday, May 14, Saturn’s retrograde orbital motion westward will carry it past the bright star cluster designated Messier 22, also known as the Sagittarius Cluster. Closest approach of 1.6 degrees occurs around May 14, when Saturn will be positioned directly above the cluster. Both objects will appear together in the field of view of a low power telescope (orange circle) or binoculars. At its new phase, the moon is travelling between Earth and the sun. Since sunlight is only reaching the far side of the moon, and the moon is in the same region of the sky as the sun, the moon will be completely hidden from view. A day or two after new moon, look for the slender sliver of the young crescent moon to re-appear just above the western horizon after sunset. Low in the western sky during late evening on Saturday, May 19, the waxing crescent moon will be situated about 6 degrees below the large open star cluster in Cancer known as the Beehive. Other names are Praesepe and Messier 44. Binoculars will show both the moon and the cluster in the same field of view (orange circle). Observers in western North America will see the moon move to within 4 degrees of the cluster before moonset. In the northwestern evening sky of Sunday, May 30, Venus’ orbital motion will carry it within a degree to the right of the bright open star cluster designated Messier 35 in Gemini. Both objects will appear together in the field of view of a low power telescope (orange circle) or binoculars. In late evening on Monday, May 21, the first quarter moon will be situated just above Regulus. At magnitude 1.3, it is the brightest star in Leo. Both objects will fit into the field of view of a small telescope at low power (orange circle). By observing the relative positions of the two objects between dusk and moonset several hours later, the moon’s eastward orbital motion will be made apparent. Minimum separation occurs about 11:15 p.m. EDT. After the moon has completed the first quarter of its orbit around Earth, the relative positions of the Earth, sun, and moon cause us to see it half illuminated – on its eastern side. A first quarter moon always rises around noon and sets around midnight, so it is also visible in the afternoon daytime sky. The evenings around first quarter are the best times to see the lunar terrain while it is dramatically lit by low-angled sunlight. In the southeastern sky on the evening of Sunday, May 27, the nearly full moon and Jupiter will be separated by less than 5 degrees. The two objects will cross the sky together during the night, but the moon’s separation from the bright planet will increase as the moon slides eastwards in its orbit. The May full moon, known as the Full Milk Moon, Full Flower Moon, or Full Corn Planting Moon, always shines in or near the stars of Libra. Full moons always rise in the east as the sun sets, and set in the west at sunrise. Since no shadows are cast by the vertically impinging sunlight on a full moon, all of the brightness differences are generated by the reflectivity, or albedo, of the surface rocks. In late evening on Wednesday, May 31, the waning gibbous moon will rise in the east with Saturn. The moon will sit only two degrees east of the ringed planet and both objects will fit easily within the field of view of binoculars (orange circle). If you place the naked-eye star Kaus Borealis (Lambda Sagittarii) on the lower right edge of the field, the Messier objects M25, M22, and M28 will be in the same field, at upper left, bottom centre, and lower right respectively. Mercury will open May among the stars of Pisces – just a few days after its greatest western elongation, and still nearly 27 degrees west of the Sun. For observers in the Northern Hemisphere, the elusive planet will be visible with difficulty in the eastern pre-dawn sky. For most of May, the planet will creep northwards through Aries and into Taurus while hugging the horizon. As it swings towards the sun, the increasing tilt of the morning ecliptic will keep it in view by lifting it higher. During this period of time, Mercury will brighten steadily and shrink in apparent diameter while it waxes from a half-illuminated phase to nearly full. The planet will become lost in the sun’s glare by month’s end. The May apparition will be a very good one for Southern Hemisphere observers. During May, Venus continues a long and very good apparition that lasts into early autumn. Each evening through the month, our extremely bright sister planet will climb the western early evening sky – moving between the horns of Taurus in mid-month and passing into Gemini on May 19th. On May 1st, Venus will set about 10:45 p.m. local time. On May 31st, it will set after 11:30 p.m. local time. Venus will continually brighten throughout May, reaching magnitude -3.94 at month’s end. Meanwhile, its apparent disk size will increase slightly and its illuminated phase will drop slightly, to 88%. After sunset on May 17, a very young crescent moon will be visible sitting six degrees to the left of the planet. On May 20, Venus will pass only a degree to the north of the bright open cluster designated Messier 35. The pair will fit within the field of view of binoculars. Mars will spend May in the southeastern pre-dawn sky. Its prograde motion will carry it out of the stars of Sagittarius and into Capricornus on May 15th. During the course of May, Earth’s orbital motion will continue to reduce our distance from the Red Planet. As a result, Mars will double in brightness (from visual magnitude -0.38 to -1.2) and its apparent disk diameter will dramatically increase from 11 to 15 arc-seconds. The last quarter moon will sit 2 degrees above Mars on May 6th. On May 14th, Mars will pass only 18 arc-minutes (or 2/3 of the full moon’s diameter) below the small globular star cluster designated Messier 75. Both objects will appear together in the field of view of a high power telescope. During May, very bright Jupiter (visual magnitude -2.5) will be an all-night target in central Libra, slowly moving westward in a retrograde loop that will last until July. The planet will reach opposition on May 9th, when it will exhibit a large 43.8 arc-second disk and be located 37 light-minutes from Earth. This will also be a fine time to observe Jupiter’s four Galilean moons. In the southern sky on the evening of May 27th, the nearly full moon and Jupiter will be separated by less than 5 degrees. The two objects will cross the sky together during the night, but the moon’s separation from the bright planet will increase as the moon slides eastwards in its orbit. Jupiter will end May sitting less than a degree north of the bright double star Zubenelgenubi. Saturn will spend May as a medium bright (magnitude 0.35) yellowish object moving retrograde through the northern part of Sagittarius, on the eastern side of the Milky Way. In early May, the ringed planet will rise in the east shortly after midnight and remain visible until dawn, when it will be 23 degrees above the southern horizon. On May 4th, the waning gibbous moon will be positioned about 6 degrees to the right of Saturn. The following morning, the moon will jump to the planet’s left. On the mornings surrounding May 14th, Saturn will move past the bright star cluster designated Messier 22, also known as the Sagittarius Cluster. Closest approach of 1.6 degrees occurs around May 14th, when Saturn will be positioned directly above the cluster. Both objects will appear together in the field of view of a low power telescope or binoculars. During May, blue-green Uranus will be in the pre-dawn sky among the stars of southwestern Aries, but it will not be observable until late in the month when it will begin to rise in a dark sky, at about 4 a.m. local time. Blue-tinted Neptune will spend May in the eastern pre-dawn sky among the stars of Aquarius – sitting about 4 degrees to the east of the naked eye star Hydor. As the month wears on, the planet will rise earlier, increasing the window of time for observing it in telescopes before morning twilight. Degrees (measuring the sky): The sky is 360 degrees all the way around, which means roughly 180 degrees from horizon to horizon. It’s easy to measure distances between objects: Your fist on an outstretched arm covers about 10 degrees of sky, while a finger covers about one degree. Daytime skywatching: When Venus is visible (that is, not in front of or behind the sun) it can often be spotted during the day. But you’ll need to know where to look. A sky map is helpful. When the sun has large sunspots, they can be seen without a telescope. However, it’s unsafe to look at the sun without protective eyewear. See our video on how to safely observe the sun, or our safe sunwatching infographic. This photo from NASA’s Solar Dynamics Observatory (SDO) spacecraft, snapped on June 1, 2012, shows a feature that looks like Big Bird on the surface of the sun (SDO staff added the picture of the “Sesame Street” character). The feature is actually a coronal hole, a dark region in the sun’s upper atmosphere. The image, snapped today (June 1) by NASA’s Solar Dynamics Observatory(SDO) probe, actually shows a so-called coronal hole — an area where the sun’s corona, or outer atmosphere, is dark. But the resemblance to Big Bird, or one of his feathered kin anyway, is uncanny. “I can’t get over how much this looks like Big Bird — but it is a coronal hole on the sun,” reads a Twitter post today by Camilla Corona SDO, the spacecraft’s rubber chicken mascot. The rubber chicken’s Twitter feed is part of NASA’s social media outreach efforts. Officials pasted a picture of the “Sesame Street” character next to the ‘Big Bird’ coronal hole for comparison. The image of Big Bird on the sun is an example of pareidolia, which is the tendency of the human brain to recognize animals or other prominent shapes in vague or random images. This view of an elephant’s head on Mars is another example. Coronal holes are associated with “open” magnetic field lines, which extend out into interplanetary space rather than arc back to the solar surface. Coronal holes are often found near the sun’s poles, Camilla added, and the high-speed solar wind — a stream of charged particles flowing from the sun’s upper atmosphere — is known to originate in them. The super-speedy solar wind from the ‘Big Bird’ coronal hole will reach Earth between June 5 and June 7, Camilla said. This photo from NASA’s Solar Dynamics Observatory spacecraft, snapped on June 1, 2012, captures what looks like Big Bird on the surface of the sun. The feature is actually a coronal hole, a dark area of the sun’s upper atmosphere. After remaining relatively quiet for several years, the sun has entered an active phase of its 11-year solar cycle, firing off a number of strong flares and coronal mass ejections (CMEs) — huge clouds of solar plasma — in the past several months. CMEs that hit Earth inject large amounts of energy into the planet’s magnetic field, spawning potentially devastating geomagnetic storms that can disrupt GPS signals, radio communications and power grids for days, researchers say. These storms can also super-charge the northern and southern lights, generating brilliant shows for skywatchers at high latitudes. Experts think the current cycle, known as Solar Cycle 24, will peak in 2013. The $850 million SDO spacecraft launched in February 2010. The probe’s five-year mission is the cornerstone of a NASA science program called Living with a Star, which aims to help researchers better understand aspects of the sun-Earth system that affect our lives and society. A possible ninth planet in the solar system, known as Planet 9, is illustrated orbiting far beyond Neptune’s orbit (shown as a ring around the sun). The solar system just got a bit stranger. As astronomers continue their ongoing quest to find the elusive Planet Nine, a team found a space rock that lends credence to the idea that a huge super-Earth planet really exists in the outer reaches of our solar system. The newfound asteroid, called 2015 BP519, adds to a growing body of evidence about little worlds in the solar system being perturbed by something big. Astronomers detailed its discovery and description in a new paper, adding that the bizarre angle of its orbit gives more weight to the idea that a big planet is out there — somewhere — tugging on the asteroid’s path around the sun. It’s not the first time Planet Nine was blamed for pushing an object around. Back in 2014, before Planet Nine was officially hypothesized, astronomers Scott Sheppard and Chadwick Trujillo noticed orbital irregularities in several small bodies beyond Neptune’s orbit. These included dwarf planet Sedna, a newfound object called 2012 VP113, and several other trans-Neptunian objects (TNOs). The potential orbit of Planet 9, illustrated with the existing orbit of several trans-Neptunian objects (TNOs). A flood of studies followed about TNOs and how Planet Nine might have affected their orbits; the following summary is just a sampling. Not all teams were enthusiastic, with one group from the Outer Solar System Origins Survey (OSSOS) cautioning that many of these surveys could be just observational bias. By October 2017, Batygin said, there were at least five different lines of evidence that suggest the existence of the planet. “If you were to remove this explanation and imagine Planet Nine does not exist, then you generate more problems than you solve. All of a sudden, you have five different puzzles, and you must come up with five different theories to explain them,” he said in a statement. Follow us @Spacedotcom, Facebook and Google+. Original article onSpace.com. Huges, slow-moving swirls called Rossby waves have been detected on the sun. These waves move in the opposite direction of the sun’s rotation. Huge, slow-moving waves that drive Earth’s weather and shape the swirls in Jupiter’s atmosphere also exist on the sun, new research reveals. Even so, these waves move very slowly, with shallow troughs and peaks, so they aren’t always easy to detect, especially amid the other swirls and disturbances on a body as lively as the sun. Researchers from the Max Planck Institute for Solar System Research, the University of Göttingen (both in Germany), New York University Abu Dhabi and Stanford University analyzed data from the SDO’s Helioseismic and Magnetic Imager instrument. They focused on bubble-like granules on the visible surface of the sun, called the photosphere. These granules — each about 600 miles (1,000 kilometers) across, according to NASA — are the peak of convection cells, where heated material from the sun’s interior pops up toward the surface, spreads out and then cools, sinking down along the dark lines that divide the granules. According to NASA, these granules are hyperintense, with materials bubbling up as fast as 15,000 mph (more than 24,000 km/h). The movements of these granules revealed underlying Rossby waves, the researchers reported May 7 in the journal Nature Astronomy. The researchers found that the waves occur deep below the surface of the sun, about 12,400 miles (20,000 km) in its interior. They estimate that the waves are responsible for about half of the sun’s kinetic energy, making them key to understanding the star’s internal dynamics.